The chancellor recently announced £20m for schemes aimed at supporting people affected by homelessness and repeated the aim of ending rough-sleeping by 2027, whilst I welcome the investment it falls short of what is required to make real, permanent change to the issue. More than 300,000 people in Britain, one in every 200, are homeless or living in inadequate homes, according to Shelter, and as of April 281,000 people were reported as living in temporary accommodation. In London this figure rises to one in every 59 and in Newham, one of the top 50 local authority homelessness “hotspots”, one in 27 residents are homeless. And shocking as these figures are they don’t tell the whole story as they do not include people trapped in so-called “hidden homelessness”, those who rely on “sofa surfing” for a bed each night. This means that the number of homeless people in the UK now outnumbers the population of Newcastle, I’ll repeat that, there are more people sleeping rough or in temporary accommodation than the 296,478 residents of Newcastle-upon-Tyne. The chancellor says that his aim is to halve rough sleeping by 2022 and eliminate it by 2027, but it has increased by 134% in England over the last five years with 8,108 people reported as rough-sleeping in London in 2016-17, even halving it over the next 5 years would not bring the number down to the levels of 2010 when his government came to power. Outreach teams and homeless hostels can all make a difference to those already on the streets but his plans contain little to address the causes of homelessness, many of which are direct results of his own government’s policies – unemployment, a lack of social housing, little or no protection for those with shorthold tenancies and changes to the benefits system especially the ill advised roll out of Universal Credit. 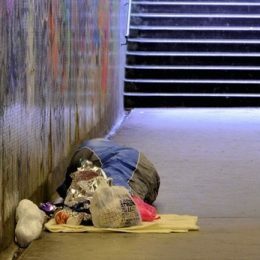 Homelessness kills, in Brighton alone 49 people classified as ‘homeless’ died in the Royal Sussex County Hospital during the last ten years, this is unacceptable in the world’s fifth largest economy, a country that prides itself on being caring and supportive. To make real, lasting change, to reduce and finally end the national disgrace of homelessness is going to take more than lip service, homelessness can be ended, poverty can be ended, but it needs the political will to make a difference.